A couple months ago I had never had a brussel sprout. I knew what they were, but I had never tried one. Anytime someone describes the taste or brussel sprouts they say it’s gross and soggy and gross! That might be why I had avoided them for so long. Then I met PaleoJoe and for dinner one day his Mom made roasted brussel sprouts. She explained that yes, depending on how you cook them they can get soggy and gross, but if you cook them right they’re crunchy and delicious. I had her brussel sprouts and I liked em! They’re just mini cabbages. What was I afraid of? For this recipe I decided to cook the brussel sprouts with bacon fat and when all is said and done, sprinkle the bacon bits over the finished product. It gives it that much more flavor AND you’re using all of your food. No tossing the bacon fat in the garbage, use it! 1. Grab a oven proof skillet big enough to fit all of your ingredients and put it on the stove to heat up on medium high heat. Note: If you do not have an oven proof skillet then a baking sheet/dish will work fine. Just trying to cut down on your dish washing. 3. 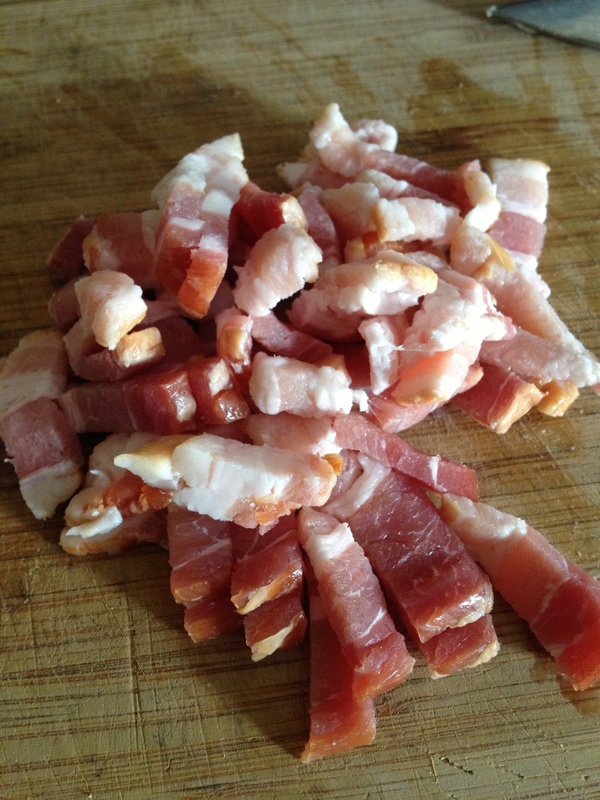 Throw your diced bacon into the skillet and cook until crispy. 7. Put skillet/baking dish in oven and cook for 15 – 20 minutes or until the veggies are to your desired level of cooked-ness. 8. Take veggies out of oven and serve!! Don’t forget to sprinkle on some those bacon bits for added texture! Additions: You can always add more to this dish if you like. Perhaps dicing up a couple cloves of garlic and letting it roast with your veggies in the oven. How about a small onion? Fresh herbs are always a great way to go. Oh and if you don’t want to cook with bacon grease then olive oil or coconut oil works just fine. Entirely up to you. This is just a guideline. If you want to make it your own then I say go for it! ENJOY! 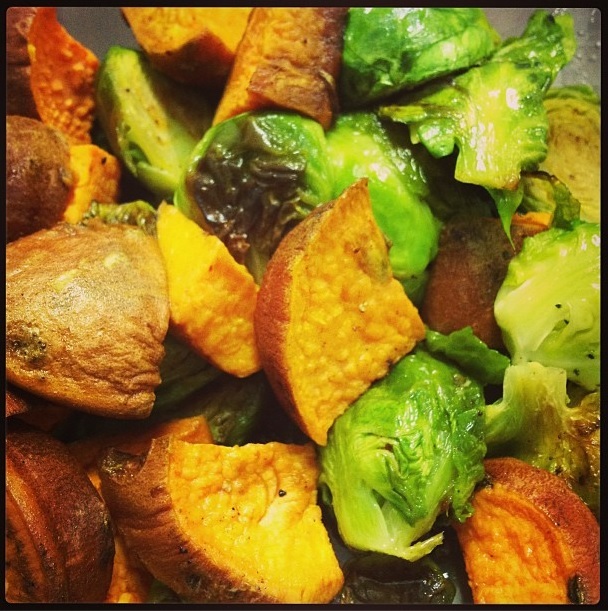 This entry was posted in Fruits and Vegetables, Recipes and tagged bacon, Brussel Sprout, caveman, caveman diet, paleo, paleo friendly, side dish, yam. Bookmark the permalink.